This form is designed for a transaction in which the landlord ground leases multiple sites to a filling station operator/tenant pursuant to a master lease agreement. The locations are adjacent to (i.e., are in the parking lots of) landlord's big box or "supercenter" retail operations. This Lease (“Lease” or “Agreement”) is made as of _________________, by and between COMMERCIAL BIG BOX RETAILER LANDLORD, INC., a __________________ corporation (“Landlord”), and FILLING STATION TENANT, INC., a _________________ corporation (“Tenant”). A. Landlord, directly or through one or more of its wholly-owned subsidiaries, owns and operates retail stores under the name of "Super-Mart" and "Super-Mart Supercenter" throughout the United States. These stores are located on parcels of land either owned, leased, or subleased by Landlord or one or more of its wholly-owned subsidiaries. References to "Landlord" in this Agreement shall include such of Landlord's wholly-owned subsidiaries, as may be relevant to the context in which the reference to "Landlord" appears. B. Tenant is a petroleum products marketer who is in the retail gasoline, convenience store and car wash business and desires to construct a Station on one or more of the Premises or Outlots owned, leased or subleased by Landlord. C. Recognizing the mutual benefits to be gained from a cooperative effort concerning the development of the Premises, Landlord does hereby lease or sublease to Tenant, and Tenant does hereby lease or sublease from Landlord, the Premises as provided for in this Agreement, setting forth their respective rights and obligations with regard to the Premises and the development of the Stations. "Tenant's Work" shall mean all physical improvements and related development of a Premises as herein provided for, including but not limited to canopies, buildings, equipment, piping, installation, construction, grading and paving. "Cost of Tenant's Work" shall mean all reasonable costs incurred in constructing a Station, including but not limited to payments to third parties for labor and materials incorporated in Tenant's Work, plus all payments to third parties for direct development costs in connection with Tenant's Work including but not limited to permit fees, legal fees, access fees and water and sewer hook-up fees. "Premises" shall mean that portion of the land that is part of Landlord's property (which is owned or leased) and which is leased or subleased to Tenant by Landlord pursuant to this Agreement. Each Premises shall be identified on a site plan submitted as part of Exhibit A and more particularly described in Exhibit C.
"Station" shall mean the motor vehicle fueling facility constructed on the Premises by Tenant, including any car wash and/or convenience store and all improvements, fixtures and equipment located thereon or used in connection therewith. "Store" shall mean the Super-Mart store and real property or Super-Mart Supercenter store and real property on which the Premises is or could be located. "Outlot" shall mean a parcel of land which is part of the original parcel acquired in conjunction with the construction of a Store by Landlord, usually bordering the major or secondary access artery and which may be available for sale or lease for retail development. "Delivery Date" shall be the date that all permits necessary to begin construction of the Station are obtained. "Rent Accrual Date" shall mean the earlier of (i) the date a Station opens to the public for business, or (ii) 120 days after the Delivery Date. Exhibit A - (furnished to Tenant by Landlord) shall contain a list of Stores with a site plan for each Store reflecting thereon the proposed location, size and configuration of a portion thereof which is thereby offered by Landlord to Tenant to lease as a proposed Premises to become subject to this Agreement. Each Exhibit A shall identify any requirements of Landlord (including without limitation any permissive or mandatory business formats, operations, activities, merchandise or services) and any known restrictions with respect to the proposed Premises (including without limitation zoning matters, easements and restrictions. Exhibit A may be supplemented by additional Exhibits A from time to time, and at any time, by Landlord. Exhibit B - (furnished to Landlord by Tenant) shall contain a list, by Store, of those proposed Premises offered by Landlord on an Exhibit A, which Tenant accepts as a Premises subject to this Agreement, and a list by Store of those proposed Premises which Tenant rejects. Any Premises not listed as accepted on an Exhibit in accordance with this Agreement shall be deemed to have been rejected by Tenant. Tenant shall be deemed to have taken possession of the Premises and this Agreement shall be in effect as to each accepted Premises as of the date of Exhibit B.
Exhibit D - (furnished to Landlord by Tenant) shall be a description of the standard site plans furnished to Landlord by Tenant at the time of execution of this Agreement. Exhibit E - shall be the schedule of rents. Prior to commencing construction of any improvement on a Premises, Tenant (at Tenant's cost) shall provide Landlord with Tenant's final, specific, detailed plans and specifications for the construction of the Station on each Premises and shall obtain the approval of Landlord. Landlord shall approve or disapprove each submission of plans and specifications within forty-five (45) days, failing which they shall be deemed to have been approved by Landlord. a. Tenant shall, in a timely fashion, pursue permits with the intent to construct or cause to be constructed at each Premises, a Station conforming to the specifications mutually agreed upon by both Landlord and Tenant, to be opened to the public for business timely and otherwise in accordance with the provisions of this Agreement. Tenant will, at Tenant's expense, cause a survey of the Premises to be conducted, which will become the basis for the site plan in Exhibit C. Tenant shall bear all costs in association with Tenant's Work. Tenant shall give Landlord notice (i) of the projected date of commencement of construction at the Premises at least ten (10) days prior thereto, and (ii) of the projected date of opening to the public for business at the Premises at least ten (10) days prior thereto. Within ninety (90) days after the date Tenant opens to the public for business at the Premises, Tenant shall furnish to Landlord Exhibit C.
b. Tenant shall, at Tenant's cost, secure all necessary zoning, permits, licenses and other required regulatory approvals necessary to begin and complete construction and to open to the public for business at the Premises in accordance with this Agreement. Landlord shall cooperate with Tenant in securing such approvals. To the extent available, Landlord shall supply Tenant with site plans including elevations and grading, drainage diagrams, storm sewer and utility line layouts and environmental site evaluations, including soil studies related to the area of the Premises, with Tenant bearing any expense of copying or reproduction. Tenant shall furnish a copy of the building permit to Landlord within one (1) week of its issuance. c. All construction shall be done in a manner so as not to materially interfere with Landlord's business and in compliance with this Agreement. Prior to entering upon the Premises, Tenant shall provide Landlord with a certificate of insurance as outlined in Article 13. All construction shall be prohibited at a Premises during the period of November 1st - December 31st of any calendar year unless otherwise approved in writing by Landlord. At all times construction equipment and materials shall be contained in an area enclosed by a 6 foot high chain-link fence or OSHA approved safety fencing no less than 4 feet high and be designated as a construction area on site and in construction plans. All work done by Tenant shall be performed in a good and workmanlike manner, in compliance with all applicable governmental laws, codes, rules and regulations, and free of any liens for labor and materials and subject to such requirements as Landlord may impose. Tenant shall indemnify and hold harmless Landlord against any loss, liability, damage, cost or expense resulting from Tenant's Work, except for any loss, liability or damage resulting from gross negligence by Landlord. During the term of this Agreement with respect to any Station, Tenant shall make no other structural alterations or improvements to, and shall place no other equipment or other facilities on the Premises except in accordance with the approved plans and specifications. If Tenant wishes to make additional material changes to the Station or Premises, Tenant must request approval from Landlord in writing. Routine equipment replacement and facility maintenance shall not be considered a material change. In performing any such alterations or improvements, Tenant will ensure that such activities do not prevent such Station from performing its intended functions for any length of time in excess of the time reasonably necessary to so repair, remodel, modify or reconfigure any such Station. a. 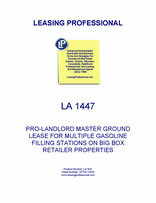 Each Premises is leased to and shall be used by Tenant solely for the purpose of installing, operating and maintaining thereon a Station and other uses, if any, identified on Exhibit A for the purpose of selling and dispensing to the general public motor fuels, convenience store products and car washes of the type identified and if and to the extent identified on Exhibit A hereto, in accordance with the provisions of this Agreement, and for no other purpose or purposes whatsoever without the specific prior approval of Landlord in each instance as provided for herein. b. During the term of this Agreement, Landlord agrees that Tenant shall have the exclusive right to operate each Station at the Stores at which a Premises is located and that Landlord shall not construct or operate a motor vehicle fueling facility, convenience store or car wash at any Store upon which a Premises is located nor grant to any other person or entity any right to construct or operate a motor vehicle fueling facility, convenience store or car wash at any Store upon which a Premises is located, provided, however, if Tenant constructs and operates a Station without a car wash, Landlord shall not be restricted in any way from entering into an agreement with another party to construct and operate a car wash at a Store upon which a Premises is located. Landlord agrees, however, that it will not enter into an agreement with another party to construct and operate a car wash at a Store upon which a Premises is located without first offering the right to construct and operate the car wash to Tenant. Upon receipt of written notification by Landlord of the offer, including the terms and conditions of the offer, Tenant shall have ten (10) days within which to notify Landlord of Tenant's acceptance of such offer under the same terms and conditions. If Tenant fails to so notify Landlord, Landlord may proceed with the proposed agreement with another party to construct and operate a car wash upon the same terms and conditions as presented in the offer to Tenant. If the terms and conditions of the offer substantially change, Landlord is obligated to provide Tenant with an opportunity to exercise its right as outlined above. c. Landlord agrees that it will not knowingly sell or lease an Outlot at a Store for the express purpose of use as a Station (with or without a convenience store or car wash in conjunction therewith) without first offering to sell or lease such Outlot to Tenant upon the same terms and conditions as the offer Landlord wishes to accept. Upon receipt of written notification by Landlord of the offer, including the terms and conditions of the offer, Tenant shall have ten (10) days within which to notify Landlord of Tenant's acceptance of such offer under the same terms and conditions. If Tenant fails to so notify Landlord, Landlord may proceed with the proposed sale or lease of such Outlot upon the same terms and conditions as presented in the offer to Tenant. If the terms and conditions of the offer substantially change, Landlord is obligated to provide Tenant with an opportunity to exercise its right of first refusal as outlined above. d. Proposed Premises which are offered to but not accepted by Tenant as a Premises in accordance with this Agreement shall not be subject thereafter to this Agreement in any respect, including without limitation this Article 3.